Please bring these back!!!!!!!!!! More colours!!! It's my go to for home or outside. I bought one pair at the store in a Toronto mall and loved them so much I ordered two more pairs online! I live in these pants! I wear them for casual and sometimes with high-heeled boots for dressing up. So comfortable...I get tons of compliments. I hope they will be made in grey or navy sometime soon. These pants are so comfortable that I bought a 2nd pair for my mother. Stretch fabric for a comfortable feel and wide waist panel that smooths out that 'lil mommy tummy. 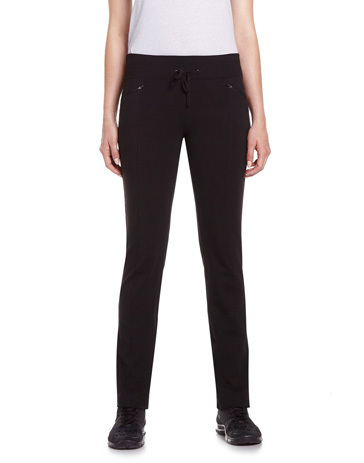 Extremely comfortable lightweight pants with back and front pockets. Nice fit with a very nice material. Got several compliments on my first wear and was also asked where I purchased them. I bought two pairs (black and navy). Would be nice to have a couple of lighter colors for next spring/summer.